It has been quite a while since I published a mount farming tip, as the main focus in these is not gold farming. Although in this case too, on top of the Reins of the Drake of the North Wind, you will receive loads of valuable trade goods, BOE blue trinkets and pure gold drops from all monsters that are in your path. Even if you're having horrible luck with mount drops, you still have a good excuse to solo farm here, in The Vortex Pinnacle. The Vortex Pinnacle is actually very easy to solo, provided that you have a good solo class and a spec. If you're not sure about your class or spec, check the previous gold making tip that focused on Soloing Vault of Archavon. It too needs a good combination. Although if you have recently dinged 85, then you should not attempt this until you have some epics on. Even the high level pvp gear in the auction house is usually enough. 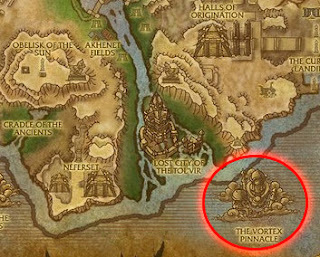 Reins of the Drake of the North Wind is a low 0.9% drop from Altairus, the second boss in The Vortex Pinnacle. That means you should not expect to see it drop on your first attempt. Personally I had to kill the boss about 13 times before it dropped, but it can take way longer than that if RNG does not favor you. Vortex Pinnacle is located in Uldum. See the map below for the exact location. The first pull is perhaps the most challenging, and biggest. But if you have heals and cooldowns ready, there shouldn't be any problems. The biggest mobs in the pack are very slow, so they can be kited by even a melee character. There's also pillars near this pack, which you can circle around slowly, making the casters unable to target you. A rogue or a druid may be able to sneak past the trash, but my instance farmer lacks the stealth skill. Once the first pack is dealt with, the rest shouldn't give you any trouble. Although closer to the second boss there will be more big pulls. These are easy though, as long as you don't stay in the hurricanes they cast. Kuja's Protip: A Death Knight can Dark Simulacrum these hurricanes. These deal a huge amount of damage on packs this big. No channeling required either. Best place for Volatile Air farming? 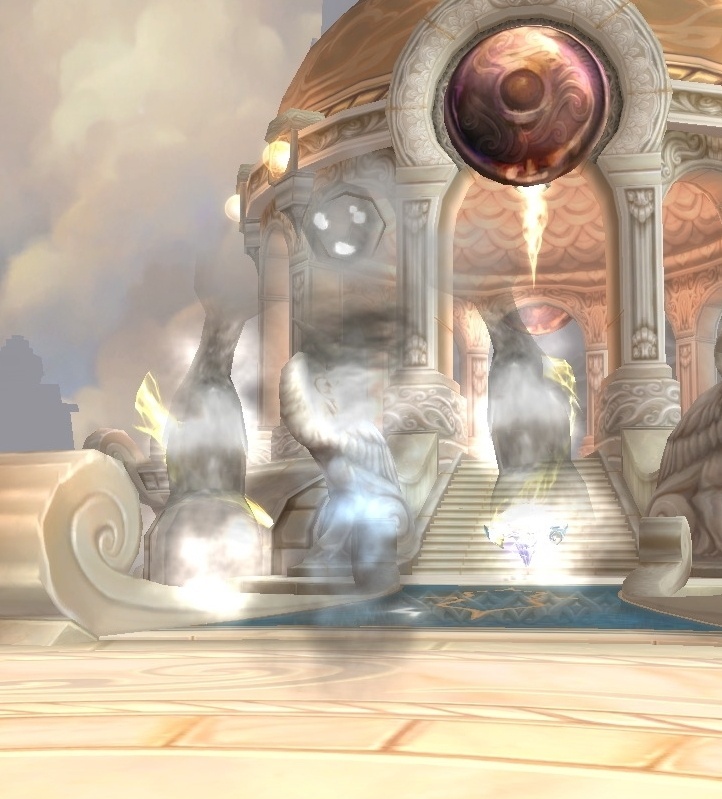 Monsters in this part of the instance are mainly air elementals. That means you will be seeing lots of Volatile Air. A single air elemental has a 37% chance to drop Volatile Air, and when the percentage favors you, there will be up to 6 x Volatile Air to be looted every single time. On top of the volatiles, depending on if you're farming the instance in Heroic or Normal mode, you will be seeing Small or normal Heavenly Shards, provided you can disenchant the loot. Most monsters here, especially the Young Storm Dragons have a decent drop rate of roughly 4% for Rainsong. While spirit is not the most valuable stat a trinket can have, it's still a level 81 trinket which many leveling casters will want to have. There's hardly any for sale these days too, so selling these for 500-1500g is normal and people will buy them. for a mage (especially engineer + with use of blink and runspeed increase invis glyph) it's easy to farm as well, you only need to kill 2 bosses. ring of frost in middle of first pack, blink to bridge frost nova and time your invis, you should be able to blink past last 2 mobs onto the bridge below. There blink between the 2 mobs to the boss and burn him down. After ring of frost on a side so the adds get trapped run and frost nova the 2 adds, blink hit 2 orbs and after those go invis again up to the drake. Use BM spec and create a misdirect macro so your pet will take all the beating. Also give your pet tanking talents.